Access to affordable healthcare has emerged as an important societal need. The total therapy package provided to participants included weekly acupuncture, Tui-Na massage, auricular acupoint stimulation, and Gua Sha. The research was conducted by investigators from the Icahn School of Medicine at Mount Sinai (New York), Mount Sinai Beth Israel Medical Center (New York), and the Hunter-Bellevue School of Nursing (New York). The results were published in Pain Medicine, a publication of the American Academy of Pain Medicine. The researchers quantified significant clinical benefits. Acupuncture plus TCM modalities not only reduced pain levels, but also significantly reduced pain interference and depression levels. Pain interference is a measure of pain’s debilitating influences on aspects of life including mood, walking, work activities, general activities, and sleep. Moreover, study participants document a significant reduction in pain medication consumption. Pain medication rates dropped from 87% at baseline to 65% at the 24 week data point. 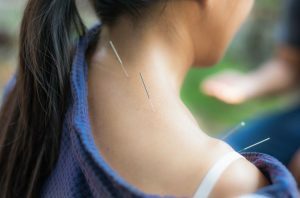 The findings demonstrate that although no additional acupuncture treatments or TCM modalities are provided after the 8 week data point, patients have enduring benefits as documented at the 24 week data point. ← Should you try acupuncture for acne?